A Plymouth University-run social enterprise that brings dental treatment, education and care into the community has won a prestigious national newspaper award. The Peninsula Dental Social Enterprise (PDSE) was named as the winner of the Social and Community Impact category at the 2015 Guardian University Awards. It beat fellow finalists the University of Manchester and the University of Nottingham to claim its second national honour, after winning a Green Gown Award for Enterprise in October of last year. Wendy Smith, Community Engagement Lead, received the award from Ronni Ancona, who was the celebrity host for the event in London last night. PDSE runs four Dental Education Facilities across the South West where dental profession students from Plymouth University treat NHS patients as part of their training, under the supervision of qualified dental care professionals. It also carries out a wide range of social and community engagement projects, some involving students, which aim to improve oral health and awareness and improve access to dental care – especially for those in the community who need it most. The PDSE was launched in 2013 to better oversee the funding and running of the four Dental Education Facilities in Devonport, Derriford, Truro and Exeter, and at the time represented a national first in being the first time a clinical entity had been housed within a social enterprise. It has been officially recognised with the Social Enterprise Mark, which is an independent validation that demonstrates it is creating social value. 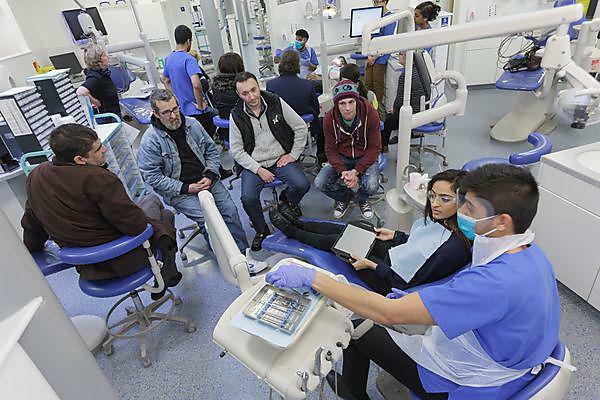 Around 16,000 NHS patients receive care at the centres, where University students studying for a career in dental health (as a dentist, nurse, hygienist or therapist) are supervised by qualified and experience dental health professionals. The PDSE also orchestrates outreach work, which includes improving awareness of oral health in the wider community, focusing on groups such as schoolchildren, the elderly, parents, those with specific conditions, people with special needs, substance abusers, and prisoners. Recent projects have seen students and staff working with the Big Issue to reach homeless people, and the creation of a new film in partnership with Wrigleys and Plymouth Music Zone, which is being shown to children at the University’s Immersive Vision Theatre. It is the second Guardian University Award that Plymouth has won in the three years the awards have been running, following on from the University's 2013 award for its eBooks project, which sees first-year students receive free e-versions of their course textbooks to aid their learning.